There can’t be a story about war without fear and pain and loss and grief. For every solider who makes it home alive, there is another whose family is experiencing a profound loss. 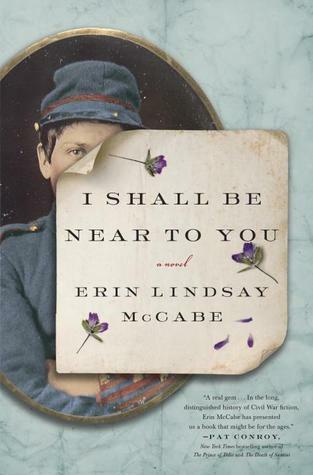 All of these realities are palpable in I Shall Be Near To You by Erin Lindsay McCabe. The book is set during the Civil War and just after the wedding of Rosetta and Jeremiah Wakefield. Rosetta doesn’t want her new husband to enlist in the Union army but he know that their dream of having a farm in Nebraska will come true that much sooner with the pay he will earn as a soldier. From the wedding preparations to the wedding itself and Jeremiah’s clandestine departure, Rosetta narrates her story. She tells about life with her new in-laws and the fearsome emotions running through her heart and mind. She tells about how she cuts her hair, dresses in men’s clothing, and enlists as a Union officer herself in order to be with Jeremiah. I Shall Be Near To You is a heart-rending and gut-wrenching story. The author based the character of Rosetta on a real person who lived and served in the Union army during the Civil War. While the stories and paths of the real and the fiction Rosetta differ, the grit and determination both women showed practically leaps off the pages of this book. I enjoyed this book, but it’s also haunting me. The love between Rosetta and Jeremiah, their stolen time together, the heartbreak at the end, and the hope for a new, different path to the future. Disclaimer: I received this book for free from Blogging for Books in exchange for an honest review. This does not affect my opinion of the book or the content of my review. This sounds like a great story! I love Civil War reads. Thankfully my library has a copy. 🙂 Thanks for sharing! My pleasure! I had set the book aside for a little while and, once I got to reading, was sad that I waited so long. I hope you enjoy it!